„We will produce a documentary film“, said our teachers to us students when they presented the project for the first time to us. For producing such a film, we first of all should know what a documentary film actually is: A documentary film is a nonfictional movie, made in order to document some aspects of reality, so that you can use it for education, historical records, etc. Well, the content of our documentary film is – according to our project – migration. So each country produces a 12-minute film about different stories of migrants living in their country. Some of us made interviews, others filmed their daily life … Between these five 12-minute films, two students will talk about them and that´s how we try to connect all the different movies from the different countries. The film will be made entirely by students: The cutting, the preparing, the search for migrants who want to be shown in our film, the text writing and the filming itself. So it won´t be as perfect as a Hollywood production. But that´s not even our purpose. What we produce this film for, is the documentation of the life and the stories of migrants and their answers to the questions why they were looking for a new home, why they had to leave their home country, how the trip was, how they were able to find their way in this new country and what made them choose Germany, France, Italy, Sweden or Denmark. 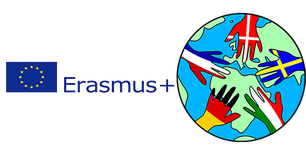 Erasmus+ Documentary film "Migration in Europe"